The South African National Survey on Research and Experimental Development is a flagship annual project for CeSTII, which it performs on behalf of the South African Department of Science and Technology (DST). Each year the survey reports the latest available data on R&D expenditure and performance across five sectors: higher education, science councils, government, business, and not-for-profit organisations. Gross Domestic Expenditure on R&D (GERD) increased from 0.77% in 2014/15 to 0.80% in 2015/16. The largest performer of R&D in 2015/16 was the business sector (42.7% of GERD), followed by higher education (30.5%), then science councils (17.8%), government (6.2%) and not-for-profit organisations (2.8%). In Rand terms, expenditure on R&D by sector in 2015/16 was recorded as R13.8 billion (business), R9.9 billion (higher education), R5.7 billion (science councils), R2 billion (government) and R891 million (not-for-profit organisations). Government provided the most funding for R&D in South Africa in 2015/16, notably R14.4 billion or 44.6% of total R&D funding. The business sector contributed R12.6 billion to R&D in South Africa, or 38.9% of total R&D funding. Foreign sources of R&D funding comprised R4.2 billion of total R&D funding or 13%. Expenditure on applied research declined to 47.5% of GERD in 2015/16 from 48.8% of GERD in 2014/15. Expenditure on basic research was 25.4% in 2015/16 and expenditure on experimental development was 27.1%, both reflecting increases from the 2014/15 reference period. In terms of R&D personnel, the total headcount grew by 3.5%, from 72,400 in 2014/15 to 74,931 in 2015/16. Gross Domestic Expenditure on R&D (GERD) increased from 0.73% in 2013/14 to 0.77% in 2014/15. The largest performer of R&D in 2014/15 was the business sector (45.3% of GERD), followed by higher education (28.5% of GERD), then science councils (17.1%), government (6.5%) and not-for-profit organisations (2.6%). In Rand terms, expenditure on R&D by sector in 2014/15 was recorded as business (R13.3 billion), higher education (R8.4 billion), science councils (R5 billion), government (R1.9 billion) and not-for-profit organisations (R779 million). Government provided the most funding for R&D in South Africa in 2014/15, notably R12.9 billion or 43.9% of total R&D funding. The business sector contributed R12 billion to R&D in South Africa, or 40.8% of total R&D funding. Foreign sources of R&D funding comprised 12.2% of total R&D funding or R3.6 billion. While expenditure on basic research increased from 23.8% of GERD in 2010/11 to 24.3%, expenditure on experimental development dropped to 26.9% in 2014/15 from 28.9% in 2013/14. Expenditure on applied research increased from 47.3% of GERD in 2013/14 to 48.8% of GERD in 2014/15. In terms of R&D personnel, the headcount grew by 5.2%, from 68,838 in 2013/14 to 72,400 in 2014/15. Next to the R&D Survey, the South African Business Innovation Survey (BIS) is a second flagship survey performed by CeSTII for the DST. Since 2005, CeSTII has conducted three rounds of the BIS, covering the periods 2002-2004, 2005-2007 and 2010-2012. In September 2017, CeSTII launched fieldwork for the 2014-2016 round of the BIS. Previous BIS surveys performed by CeSTII have followed the methodology set out in the Oslo Manual. 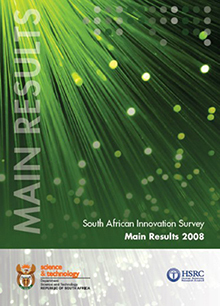 However the measurement of innovation through these surveys has tried, where possible, to taken into count the distinctive context of South Africa—being in Africa, the Global South, and characterised as a middle income country, with both highly and weakly developed economic structures, and pressing socio-economic challenges. A number of challenges were faced in the performance of the 2010-2012 BIS. An immediate problem was the low response rate, but this highlighted key conceptual and methodological issues, such as whether the survey is measuring what it should, or whether the methodology is appropriate for the South African context. Building from these results, and working closely with the DST, in 2016 CeSTII embarked on a comprehensive review of the BIS. Its goals? To reflect on the innovation theory and methodology underpinning the BIS in the context of the review of the third edition of the Oslo Manual, which is currently underway; and to propose amendments to the survey instrument and sample frame in line with current developments across the South African economy. The review process was necessarily in-depth and incorporated three components: first, an internal critical self-assessment; second, an external review by a specialist consultant, incorporating an international comparative perspective; and third, the oversight of a BIS Review Steering Committee consisting of BIS stakeholders such as the National Advisory Council on Innovation (NACI), Statistics South Africa, the Technology Innovation Agency (TIA), and the DST. In early 2017, CeSTII worked toward the completion of a research partnership project involving the DST, the National Intellectual Property Management Office (NIPMO), and the Southern African Research and Innovation Management Association (SARIMA). 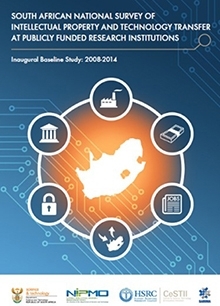 The South African National Survey of Intellectual Property and Technology Transfer in Publicly Funded Research Institutions: Inaugural Baseline Study (2008-2014) was launched at the Innovation Hub on 12 April 2017. “This inaugural survey is an important addition to a portfolio of instruments that are used in assessing the performance of the South African National System of Innovation (NSI),” writes science and technology minister, Naledi Pandor, in her preface to the report. The IP&TT survey was embarked on to establish a number of baseline indicators that are required to track overall activity in Intellectual Property (IP) management and Technology Transfer (TT). Questionnaires were sent to all ‘institutions’ as defined in the Intellectual Property Rights from Publicly Financed Research and Development Act (IPR Act), which are the 23 Higher Education Institutions (HEIs) and the 10 Schedule 1 institutions or Science Councils (SCs). Valid responses were obtained from 24 institutions. Of these, 23 indicated that they have either established a dedicated office of technology transfer (OTT), have dedicated TT individuals or are members of a regional office. Management of technologies, patent families, trade mark families, registered design families and new patent applications filed increased more rapidly than the increase in research expenditure, which indicates acceleration of these activities relative to research expenditure. On average, 100 new technologies were added annually between 2011 and 2014 to the portfolio managed by respondent institutions. There has been a quadrupling in the actual number of licences executed per year in the period. Of significance is that more than 88% of this revenue accrued consistently each year to the same four institutions that have well-established TTFs. The majority of IP transactions yielded less than R100 000 per year. In total, 45 start-up companies were formed over the period to commercialise the institutions’ technology, 73% of which were based on publicly funded IP.